We all have them. Those unflattering points in our academic path, and subsequently – in our application package: grades (GPA) that aren’t as high as we wished; a reference letter that is not as shiny as expected; a suspension; or a story not coherent or focused enough. Recently, we received a question in our forum on how to present unflattering information in an application. We decided to elaborate on it here for the benefit of our community. First step: If you determine that this information will be known to the committee through your transcripts, resume or any other application materials, then you have no choice but to discuss it. Otherwise, you need to identify whether this information is really important and negative, or if it is only important and negative in your own subjective eyes. The test of whether it is important and negative, includes two components: first, will it seem negative to the admissions committee? We receive questions from great applicants who did not meet their personal expectations, and thus undervalue their achievements. Others are trying to demonstrate high standards by “complaining” about what is actually a great GPA. Not a good idea. Second - is this information important? You really don’t need to explain dropping out of that extra-curricular activity in 7th grade. One low grade from 5 years back would also not raise any eyebrow. Take into account that as an international student, the school you are applying to will not know all the nuances of your past experiences. Get out of your own skin and seriously think whether they will even interpret whatever this is as negative. If this is not important and negative information in the eyes of the committee, just don’t say anything. Discussing it may portray you as someone negative, or someone who cannot tell what is important. Just move on! Second step: You have concluded this is important and negative information. Well, you need to explain it then - but in a way that does not leave the committee with a negative impression of you. First, ask yourself: Is there a possibility to represent this information in a good way? If so – try to do that. For example, if your experiment in the lab was based on false hypothesis and you have no publication to show for it, you can say that you found that the hypothesis was invalidated, and that this is going to serve as a basis for new research. Everything in the world can be explained using positive language or negative language. Choose the positive track. Avoid words that convey negativity, like: failure, shame, loser, blame, difficulty, fault. Instead, use: learning experience, challenge, responsibility, independence, lesson, improvement, growth. Don’t come across as insecure, judgmental, whiny, or disrespectful. People want positive people near them. Positive people also have bad experiences. But they view them positively. Never say anything bad about anybody. Even if you are correct. Don’t criticize. Don’t make excuses. Don’t blame. Don’t bad-mouth anything or anyone else on your application. Ever. Show excellence and balance in other academic fronts to overcome any negative information. Applying to graduate school abroad is a stressful process, and may cause us to act irrationally and exaggerate items in our past that may not actually seem so bad to others – and most importantly – not to the admissions committee. Follow the process described here to determine whether or not you should mention it, and if you do – how to frame it in a way that will best position you. 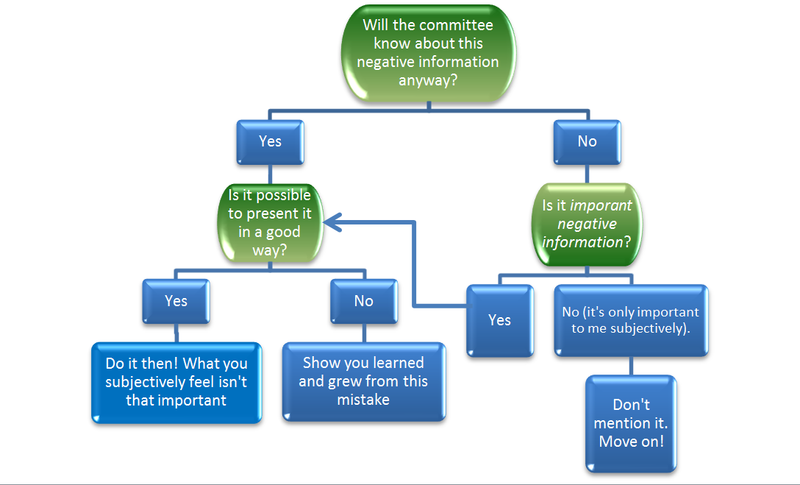 Most importantly, understand what the committee is looking for – and focus the presentation of your profile to fit that framework. F-1, J-1, OPT, SEVIS, D/S, FSO -- what is this alphabet soup?!?!! This week we are happy to have a guest blog by Sharon J. Phillips, a New York City attorney specializing in immigration and nationality law. Beyond choosing the right program and getting in to graduate school abroad, immigration is perhaps the most complex part of preparing to study abroad. The following piece will help you navigate the domain of visas, immigration status and the related ability to work while and after you are studying abroad. Enjoy! Even if you are fluent in English, you may find that becoming a foreign student in the United States will require you to learn a new language. This FAQ (:-)) should give you a crash course in the jargon you need to know to navigate the immigration process. What visas are available for foreign graduate students in the U.S.? You may study in the U.S. on an F-1 Student visa or a J-1 Exchange Visitor visa. The choice between the two visa types will be made by your school, but some schools will take your preferences and individual circumstances into account, so it's useful to know the difference. The F-1 visa allows the student to enter the United States to undertake a full-time course of study at a college or university. An F-1 visa holder maintains lawful status in the U.S. as long as he or she remains a full-time student. An F-1 student's spouse, and children under age 21, may join the student in the U.S. on F-2 visas, but are not allowed to work in the U.S. The F-1 visa offers a grace period of 60 days after the conclusion of study (or any authorized period of post-completion Optional Practical Training (OPT), discussed below), before the student must leave the U.S.
You may be eligible for a J-1 visa if your academic program is financed by a source other than your personal or family funds, including, for example, the U.S. government or your home country government or certain international organizations (i.e., Fulbright scholarships). 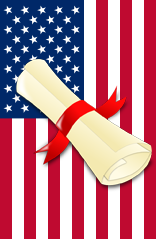 A J-1 student's spouse, and children under age 21, may join the student to the U.S. in J-2 status. J-1 students have a 30-day grace period after the conclusion of their J-1 programs before they must leave the U.S.
An attractive feature of the J visa category is that J-2 spouses may be allowed to work (they need to apply for employment authorization after they arrive in the U.S.). On the other hand, some J-1 programs require students to return to their home countries for two years at the conclusion of their studies, before they can apply for most other visa categories in the U.S. The two-year home country residence requirement can be waived under certain circumstances, but waivers can be very difficult to obtain, particularly for U. S.-funded programs such as Fulbright. 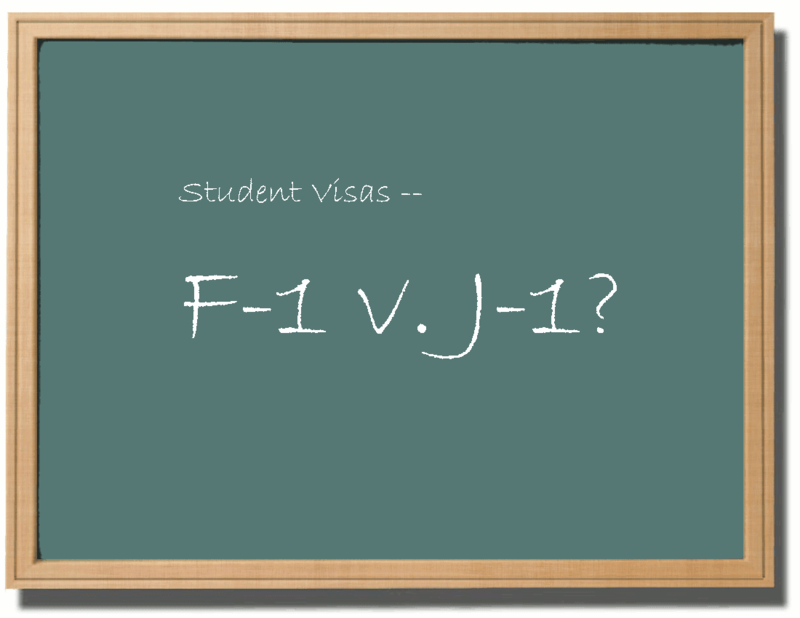 What is the process for obtaining a student visa (F-1 or J-1)? The first step is getting accepted to a college or university program. After you are accepted, your school's DSO (Designated School Officer – for F-1 programs) or RO (Responsible Officer – for J-1 programs) will issue you a document that you will use to apply for a visa at a U.S. Embassy or Consulate. If your school is offering F-1 sponsorship, your DSO will issue you an I-20 form. If your school is offering J-1 sponsorship, your RO will issue you a DS-2019 form. Once you have received your form, you must pay an I-901 SEVIS enrollment fee of $180 (J-1) or $200 (F-1) (in most cases), a visa application fee of $160 (in all cases) and a visa issuance fee (in some cases). SEVIS (Student and Exchange Visitor Information System) is a program run by ICE (Immigration & Customs Enforcement) to keep track of F-1 and J-1 students during the course of their stays in the U.S. The best way to enroll in SEVIS is to complete the I-901 and pay the SEVIS fee online at the SEVIS website, www.fmjfee.com. Some schools will coordinate your SEVIS enrollment and fee payment before issuing your I-20 or DS-2019. In this case, you can print your SEVIS I-901 fee confirmation from the SEVIS website. You also need to schedule an interview to process your visa application at the U.S. Embassy or Consulate serving the area where you live. Procedures for paying the visa application and visa issuance fees vary from country to country -- as do procedures for visa interview scheduling -- so please check the website of the U.S. Embassy or Consulate in your country. Before you go to your visa interview, you must complete a DS-160, Online Nonimmigrant Visa Application. The DS-160 (which you may recognize if you have ever applied for a U.S. tourist visa) can be found at https://ceac.state.gov/genniv. Save a copy of the DS-160 application before you click the submit button, so you will have a record of the information you submitted. Print out the barcode that the system generates, as you will need to bring this to your visa appointment. What are the main eligibility requirements for an F-1 or J-1, other than acceptance to a U.S. university? 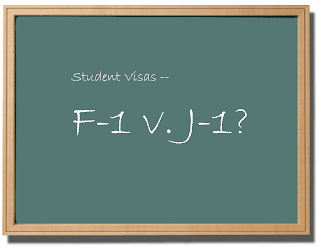 The main eligibility requirements for both F-1 and J-1 students are (1) an appropriate background and/or qualifications for the academic program, as well as adequate English language skills; (2) possession of sufficient funds to cover the cost of study and living expenses, and (3) the intention to return to your home country at the conclusion of your studies. You will need to present financial documentation to show that you can afford to pay tuition and fees, and pay for your living expenses in the U.S. without working during your studies. While there are limited provisions that allow some foreign students in the U.S. to work during their studies -- to gain practical training and/or due to unanticipated financial hardship -- you cannot rely on these provisions when you apply for your visa. Although the benefits to the U.S. of retaining the talents and skills of U.S.-educated foreign students through long-term post-graduation employment are widely understood, U.S. immigration law requires that foreign persons who wish to study in the U.S. not intend to remain in the U.S. as immigrants. Consular officers make judgments about prospective students' intentions based on a variety of factors, including the student's expressed intentions, the student's age and family situation, the student's ties to the home country, previous extended stays in the U.S., the existence of close relatives (especially fiancées or spouses) who are U.S. citizens, and the logic of the student's desire for a U.S. education based on the student's career plans in his/her home country. When can I apply for my student visa, and when can I arrive in the U.S. using my student visa? An F-1 visa can be issued up to 120 days in advance of the program start date. There is no restriction on how early a J-1 visa may be issued. Both F-1s and J-1s may be admitted to the U.S. on the F-1 visa no more than 30 days before the program start date. Can I enter the U.S. as a tourist, enroll in a graduate program, and then get a student visa without departing from the U.S.? Or must I go back to my country and apply for a student visa at the U.S. Embassy or Consulate? Can I apply for a student visa somewhere closer, like Canada or Mexico? It is important to understand the difference between visa status and a visa. "Visa status" means the length of a person's stay and the nature of permitted activities during a single visit to the U.S. A person's "status" begins when the person is admitted to the U.S. by a CBP (Customs and Border Protection) inspector, and ends when he/she departs from the U.S. A "visa" is a document that is affixed to a passport by an Embassy or Consulate that authorizes the bearer to enter the U.S. in a specific visa status. If you come from a country that participates in the visa waiver program, you may visit the U.S. as a tourist for up to 90 days without obtaining a tourist visa from an Embassy or Consulate. You may not work or study in the U.S. during the visit, and you may not apply for a change to a different visa status within the U.S. You must apply for a student visa at a U.S. Embassy or Consulate abroad. If you enter the U.S. using a B-1/B-2 (visitor for business/tourist) visa, you may be granted visa status as a tourist for up to six months. You may not work or study in the U.S. during the visit. Under limited circumstances, a B-1/B-2 visitor who has not yet enrolled in classes may apply to U.S. Citizenship & Immigration Services (USCIS) to change his or her visa status to F-1 or J-1 status without leaving the U.S., but this may not be the best approach. An application to change status from B-1/B-2 to F-1 or J-1 can take several months for USCIS to process. USCIS is likely to deny the application to change status if the intention to apply to graduate programs was not disclosed to the U.S. Embassy or Consulate that granted the B-1/B-2 visa, and indicated on the visa. Even if USCIS grants the requested change of status, the effect of the change will end the first time the person departs from the U.S. Thus, unless you plan to remain in the U.S. throughout your studies, without any trips abroad, a visit to the U.S. Embassy or Consulate to apply for an F-1 or J-1 visa will be necessary sooner or later. For this and other reasons, the best approach in most cases is to apply for an F-1 or J-1 visa at a U.S. Embassy or Consulate before you begin your studies. In most cases you must apply for an F-1 or J-1 visa at the U.S. Embassy or Consulate in your home country, and not elsewhere in the world. Consular officers in your home country are considered the best equipped to determine whether you meet the eligibility requirements (especially nonimmigrant intent). While a post in Canada or Mexico may agree to process an F-1 or J-1 visa renewal, in most cases these posts will not accept applications for initial F-1 or J-1 visas from non-Canadians/non-Mexicans. Can I work while I am on a student visa, or after graduation? During studies: on-campus. With permission from their DSO or RO, F-1 and J-1 students may engage in on-campus student employment for up to 20 hours per week. J-1 students may also receive permission to engage in employment that is required by a scholarship, fellowship or assistantship. During studies: off-campus. As discussed above, a central eligibility requirement for both F-1 and J-1 students is the ability to pay tuition, fees and living expenses for the student and any dependents without working in the U.S. However, if serious and unforeseen financial difficulties arise after a student arrives in the U.S., and if adequate on-campus employment cannot be found, the student (in either F-1 or J-1 status) may request authorization from the DSO or RO to engage in off-campus employment. This type of employment authorization is difficult to obtain, and should not be counted on. After graduation. F-1 students may apply for Optional Practical Training (OPT) authorization, to engage in employment that is directly related to the field of study. OPT may be granted either pre-completion, for part-time employment during the academic year, or for full time employment after graduation. Most F-1 students are eligible for a total of 12 months of OPT for each completed degree level. Students who earn degrees in Science, Technology, Engineering or Mathematics may qualify for an additional STEM OPT Extension of 17 months. To qualify for OPT, a student must have been a full-time student in F-1 status at the academic institution for at least one academic year. OPT is not available to J-1 students. However, with the permission of the student's RO and dean, a J-1 student may engage in paid or unpaid "academic training" either on or off campus. The training must be directly related to the major field of study, such as student teaching or clinical work. Academic training may take place during the student's studies, or must commence within 30 days of completion of study. Academic training is limited to 18 months (36 months for postdoctoral training). I have more questions. Who can answer them? Do I need a lawyer? Your main source of information about your student visa should be your DSO or RO. DSOs and ROs should be able to answer most questions that arise about the visa application process, the school's expectations, the SEVIS system and reporting requirements, and employment authorization. You can also contact USCIS' customer service number (1-800-375-5283) - but be forewarned: the customer service agent you speak with will most likely be a contractor, not an immigration official, and will most likely answer your questions based upon a script, rather than based on a detailed understanding of immigration law and policy. You may wish to speak with a lawyer who specializes in visa and immigration issues. The role of the immigration lawyer in student visa application is usually quite limited, since the process is administered by DSOs and ROs. You may want to seek legal advice if you have unusual circumstances that may interfere with your eligibility, or if you are considering working in the U.S. after graduation. Sharon J. Phillips is a New York City attorney specializing in immigration and nationality law (see www.linkedin.com/in/sharonphillips/ or visit her website: www.sjplegal.com). Immigration policies and procedures change frequently. The information provided in this article is for general informational purposes only. It is not offered as, not intended as, and does not constitute legal advice. It does not create an attorney-client relationship, and it does not give rise to any duty of care or other legal obligation.